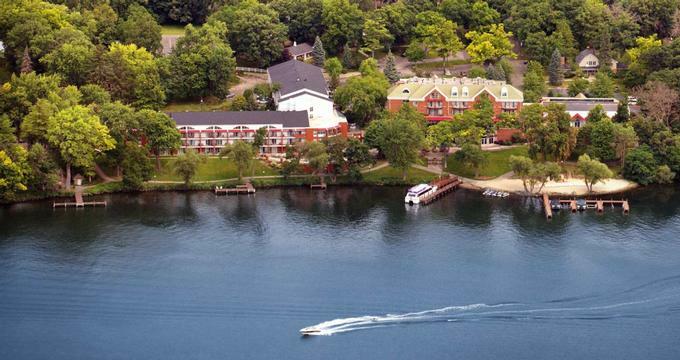 Resting on the shores of the tranquil Green Lake in Wisconsin, the Heidel House Resort & Spa is a year-round full-service resort destination that offers traditional accommodations, upscale amenities and facilities, and an array of activities for the whole family to enjoy. The beachfront resort features well-appointed guest rooms with contemporary décor and furnishings, en-suite bathrooms and modern conveniences, including coffee machines, hairdryers, and complimentary wireless Internet. Upgraded guest suites offer sitting areas with fireplaces and bathrooms with whirlpool tubs, and facilities at the resort include an indoor and outdoor swimming pool, an elegant restaurant with a fireplace and nautical themed pub with a terrace overlooking the lake. There is also a casual eatery and an ice cream parlor, as well as a fully equipped fitness center, championship golf course, sports courts, and bike and boat rentals. The Heidel House Resort & Spa is a few miles away from the Green Lake Conference Center, the Puchyan Prairie State Natural Area, and the Deacon Mills Park is perfect for the entire family, 4 minutes’ drive away. Thrasher Opera House is 2 km from the resort. The Heidel House Resort & Spa features 177 well-appointed and stylishly furnished guest rooms with en-suite bathrooms and modern conveniences. All accommodations feature king or queen-size pillow-top beds dressed in luxury linens and hypoallergenic pillows, and en-suite or shared bathrooms with walk-in showers, soaking tubs, or combinations of both, fresh towels, bathrobes, and organic bath products. Modern amenities include LCD televisions with cable channels, mini-fridges, microwaves, coffeemakers, hairdryers, irons and ironing boards, telephones with voicemail services, and complimentary wireless Internet. Guest rooms are available in Standard and Lakeview Rooms and luxurious Suites. Standard Rooms feature one king- or two queen-sized beds dressed in luxury linens and hypoallergenic pillows, and en-suite or shared bathrooms with walk-in showers, soaking tubs, or combinations of both, fresh towels, bathrobes, and organic bath products. Lakeview Rooms are slightly larger than Standard Rooms and feature two queen-sized beds dressed in luxury linens and hypoallergenic pillows, and en-suite or shared bathrooms with walk-in showers, soaking tubs, fresh towels, bathrobes, and organic bath products. Separate sitting areas have wet bars with coffee makers, fridges and double sleeper sofas for additional guests, and private balconies or patios overlooking the lake. Heidel House Resort Suites are available in One- or Two-Bedroom, Family or Whirlpool Suites and boast king-sized beds dressed in luxury linens and hypoallergenic pillows, and en-suite or shared bathrooms with walk-in showers, soaking tubs, or combinations of both, fresh towels, bathrobes, and organic bath products. Separate sitting areas have wet bars with breakfast bars, coffee makers, fridges, microwaves, and double sleeper sofas for additional guests, and private balconies or patios overlooking the lake. The Heidel House Resort & Spa has five on-site dining options that offer varied dining experiences, from elegant fine dining affairs to casual family-friendly eat-outs. The Grey Rock serves classic dishes, the BoatHouse provides casual, pub-style fare, healthy menus are on offer at the Spa Café, and appetizing meals against picturesque view at the Sunroom. The Sassy Cow Creamery ice cream in the Pump House Parlor offers an array of delectable flavors of homemade ice cream, and other light meals and snacks, along with hot beverages. A complimentary breakfast is served every morning and includes coffee, tea and hot drinks, fresh fruit and juices, cereals, granolas and yogurts, egg dishes, and freshly baked pastries, and bread. The Heidel House Resort & Spa also offers in-room dining, available daily until 9:00 pm every evening. Upscale amenities and facilities at the resort include an indoor and outdoor swimming pool with a poolside bar, five restaurants, and eateries, including a nautical-themed pub with a terrace overlooking the lake and an ice cream parlor. The resort also features a fully equipped fitness center, a championship golf course, volleyball and tennis courts, and bike and boat rentals, and water-based activities on the lake include canoeing, kayaking, paddle-boarding, tubing, wave-running, and swimming. Winter sports include skiing, snowboarding, snowmobiling, and cross-country skiing, and the beautifully designed 60-foot catamaran-style yacht, the Escapade, was custom-built for the resort and can be used for cruises and adventures on the lake. There is an exclusive spa and wellness center where guests can enjoy pampering massages and indulgent body treatments in an elegant and refined environment. With spectacular, beautiful gardens and grounds, luxurious accommodations, several restaurants and dining establishments, and professional and knowledgeable staff, the Heidel House Resort & Spa offers an ideal venue for weddings, receptions, ceremonies and corporate functions. Professional services include event planning and management, award-winning catering services, décor and setup, entertainment, music and audiovisual equipment.